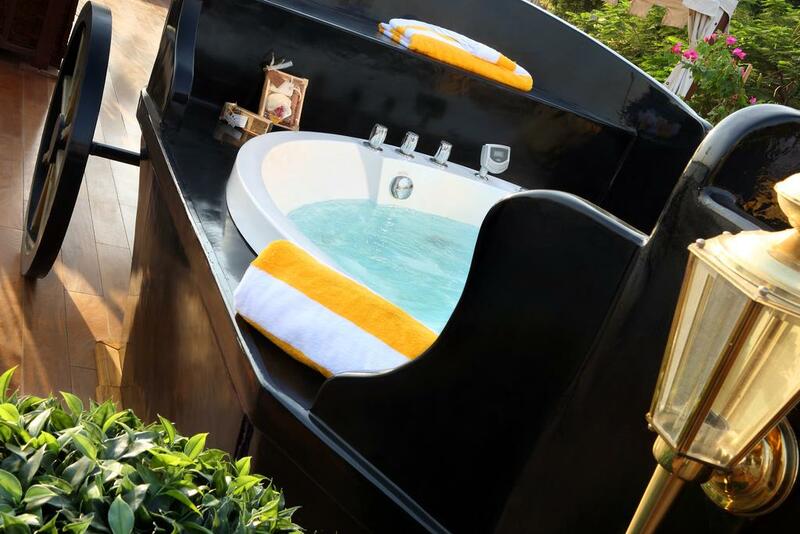 Aboard the Sonesta Amirat you will find a combination of luxury and privacy that recalls the golden age of tourism in Egypt at the beginning of the 20th century, updated with modern amenities for your comfort. 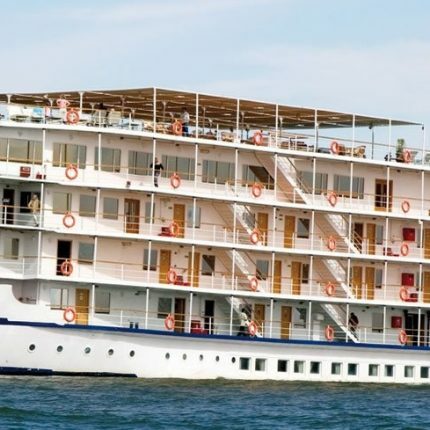 Cruise the Nile in style in the way it has been done for millennia, by the power of the wind, on this beautiful river yacht and experience the hospitality of the more gracious era of tourism. Plasma televisions and movie channels. Accompanying motorboat to pull it in case wind is calm. Upon your arrival at Aswan airport / Train station, you will be met and assisted by your tour manager from us , then you will be accompanied by your Egyptologist guide to enjoy a day tour in Aswan where you will visit Philae Temple , The High Dam with enjoy walking in Aswan Bazaar. 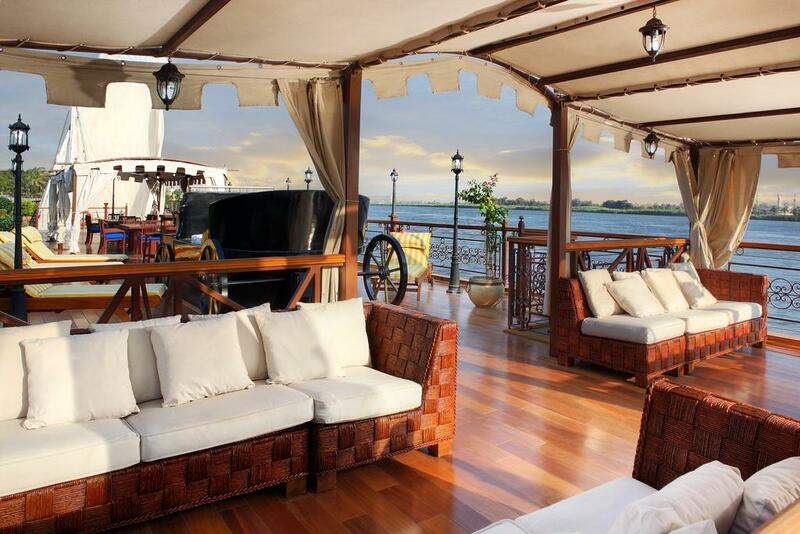 Later you will be escorted to embark your Dahabiya Nile Boat with enjoying your Lunch on Board. 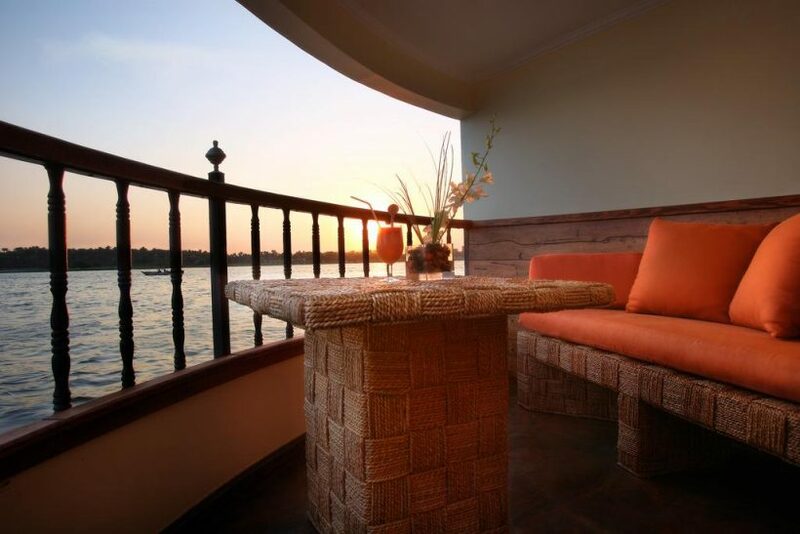 Have a charming sail to Kom Ombo. 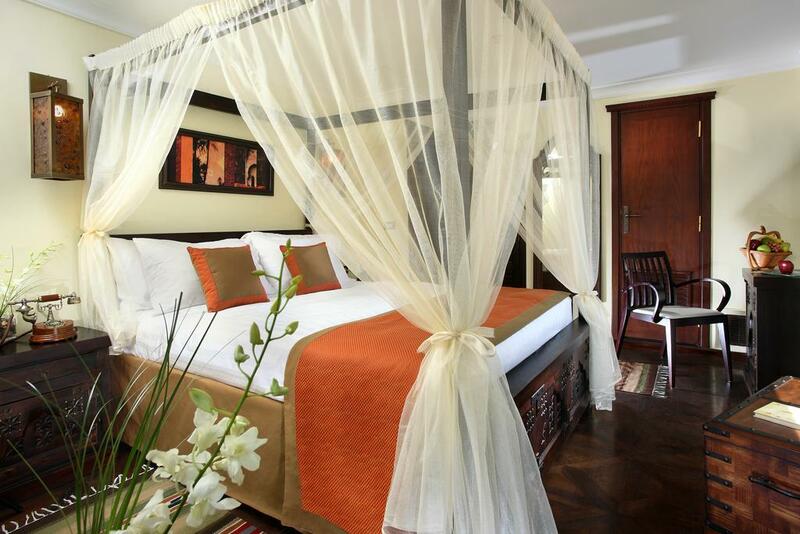 Arrive to Kom Ombo and overnight. Breakfast at your leisure. Here we visit to the Greco Roman Temple at Kom Ombo. The temple building is totally symmetrical with two entrance’s two halls and two sanctuaries dedicated to the Falcon God Haroeris (Horus the Elder) and the Crocodile God Sobek. We set off for the relaxing journey to the temple of Gebel el Silsila, another of our less frequented destinations. You will be amazed as we tie up alongside the Speos of Hormheb. If possible dinner will be served in the grounds of the illuminated temple or on the upper deck whilst soaking up the tranquil atmosphere with music to match the mood. Enjoy breakfast at your leisure, visit Edfu Temple by horse carriage, one of the largest and most intact of Egypt’s monuments. Two beautiful granite statues of the Falcon God Horus flank the entrance. After your visit to the temple, either ride or walk through the bazaar, this is an extensive bazaar where you can barter for souvenirs, spices and perfumes. We will then set sail to an island where we will disembark to get dinner served in the edge of the Nile according to weather status or dinner will be served on Sun Deck. Preparing for our EGYPTIAN EVENING OF FUN, with Egyptian cuisine, Arabic Music . Dress in your bespoke Gallabeyah or belly dancing outfit. we gently sail en-route to Esna, Overnight Esna. 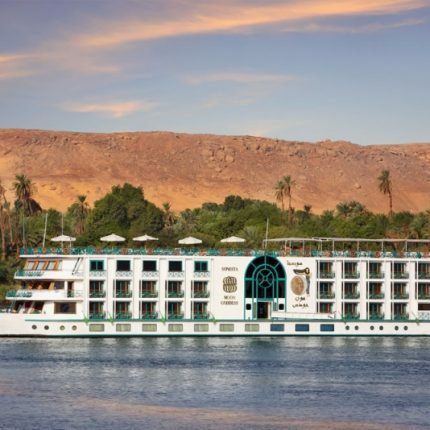 Disembarkation from your Nile boat in Esna after enjoying your breakfast, then you will be be escorted to Luxor to have a Sightseeing tour to visit the Valley of the kings, Hatshepsut Temple, Colossi of Memnon and Karnak Temple. Later you will be transferred to Luxor airport or Train station for your final departure. Upon your arrival at Luxor airport / Luxor train station, your tour manager from us will meet and assist you, then you will be accompanied by your Egyptologist tour guide for a sightseeing tour in Luxor to visit the Valley of the kings, Hatshepsut Temple, Memnon Colossi and Karnak Temple , then you will be transferred from Luxor to Esna for embarking your Nile Boat where you will be welcomed by the crew on board. Overnight in Esna on board your Nile boat. 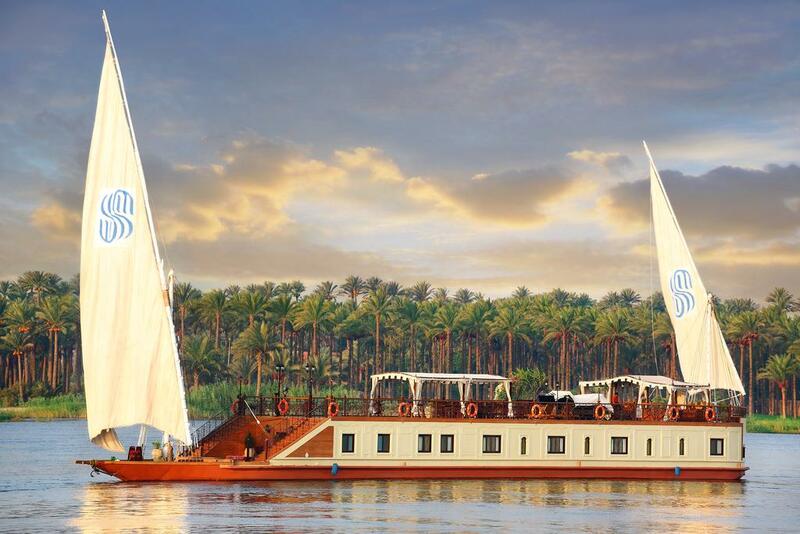 Enjoy breakfast at your leisure, sailing to Edfu, arrive around noon time. Visit Edfu Temple by horse carriage, one of the largest and most intact of Egypt’s monuments. Two beautiful granite statues of the Falcon God Horus flank the entrance. After your visit to the temple, either ride or walk through the bazaar, this is an extensive bazaar where you can barter for souvenirs, spices and perfumes. Lunch on Board then continue Sailing till Silsela Hormoheb Temple, Dinner will be served in the grounds of the Temple or in an island or on the upper deck of Boat whilst soaking up the tranquil atmosphere with music to match the mood. 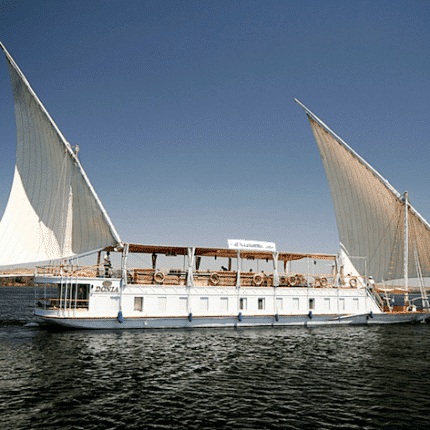 Breakfast on Board , then you will enjoy a visit to the Philae Temple, The High Dam with enjoy walking in Aswan Bazzar. Back to the boat to enjoy an amazing evening in Aswan and overnight. Disembarkation after enjoying your breakfast, then you will be transferred to Aswan airport / Aswan train station for final departure. Upon your arrival at Luxor airport / Luxor train station, you will be met and assisted by your tour manager from us, then you will be guided by your Egyptologist tour guide for a tour in Esna. 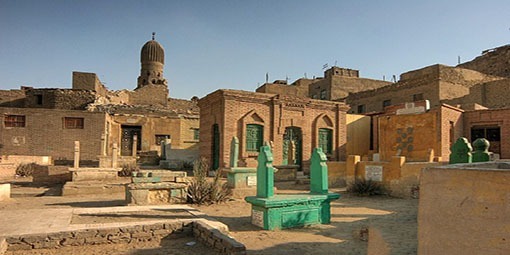 A thriving merchant town, Esna is best known for the small ancient Temple of Khnum, which sits 9 meters below street level. Your trip will begin with a brief walk to the temple and a stroll through streets filled with beautiful textiles and other exotic goods. Overnight in Esna on board your Nile boat. Whilst sleeping, we gently sail en-route to El Kab, on the East bank of the Nile, was once the capital of Upper Egypt and is still home to the temple of Nekhbet, as well as a row of fascinating decorated tombs carved into the slope of the mountains. Upon docking, you will embark on a beautiful walk through a small fishermen village to visit the necropolis. In the afternoon, the boat will arrive at Edfu, home to the Greco-Roman temple dedicated to the god Horus. This is among the best preserved of all Egyptian temples. Horse and carriage will take you to the temple through the busy city streets. After returning to the boat, you will set sail for a beautiful island. 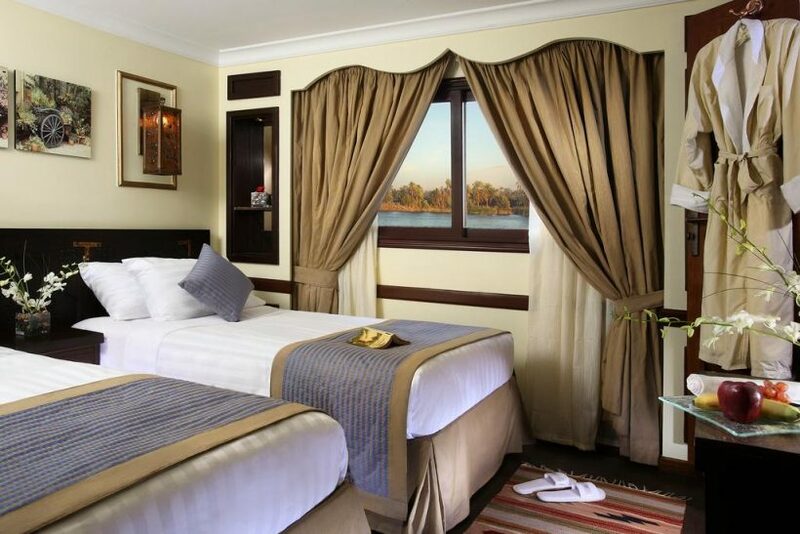 This is a day devoted to the river: immediately after an optional morning walk and breakfast, you will set sail In the afternoon, you will stop at an island for a stroll or to swim in the Nile. 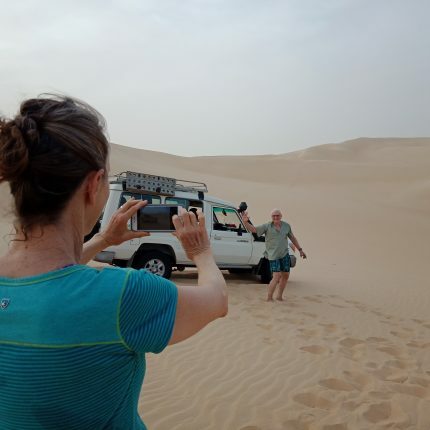 As dusk begins, there may be an opportunity to walk into the desert along a valley lined with boulders covered in ancient Egyptian hieroglyphs and stone-age inscriptions. These images mark the beginning of the shortest trail through the desert to Libya (28 days in ancient times). At night, the boat will tie up the foot of floodlit temple of Gebel Silsileh. Here, the Nile, flowing between two mountains ranges, is at its narrowest. You will usually be the only visitors at this fascinating site, as large Nile cruisers are not allowed to stop here. 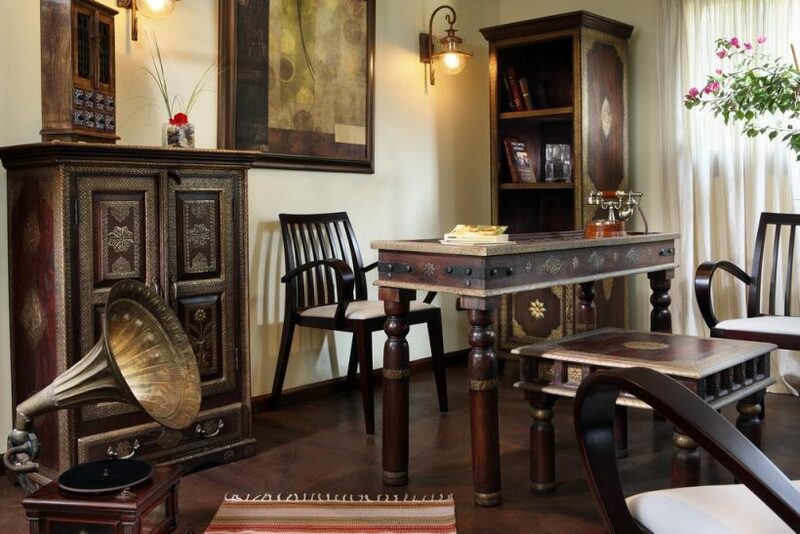 After visiting the small temple of Horemheb and walking through the sandstone quarries, where ancient Egyptians cut stone for many of their most famous temples, you will visit a picturesque café to enjoy tea and shisha (waterpipe). You will then sail to a picturesque riverbank where you will stop for lunch and swimming. After a night on the water and beneath the stars, the morning trip will take you to the town and temple of Kom Ombo. The temple was built during the Ptolemaic period on the site of an older temple and at one of the most beautiful locations, on a bend on the river. The temple was dedicated to Sobek, the crocodile-headed god. After enjoying the temple, you will visit the new Crocodile Museum, which contains many mummified crocodiles, attesting to the importance the creature played in this region in ancient times. Breakfast on board your Dahabiya Nile boat, then you will be transferred to Aswan airport / Aswan train station for final departue. 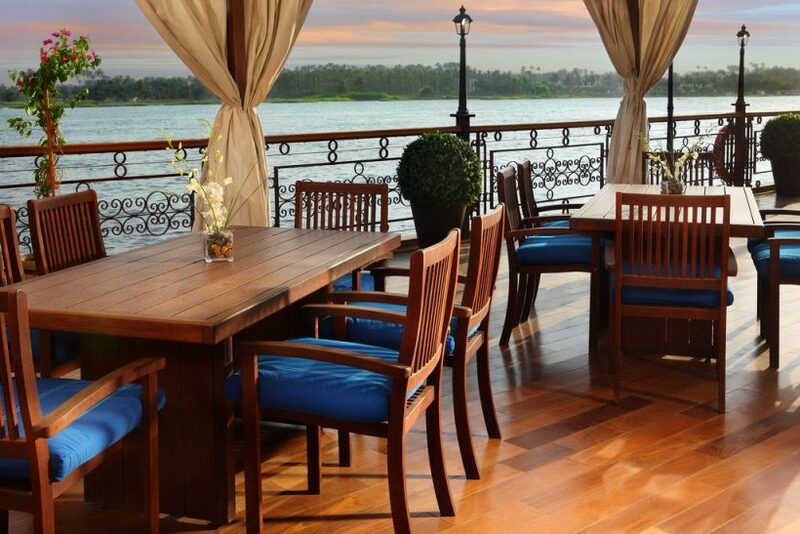 – Dinner served to you on the edge of the Nile. – Relaxing journey to the temple of Gebel el Silsila. – Tie up alongside the Speos of Hormheb. – Dinner will be served in the grounds of the illuminated temple or on board. Prices are quoted in US Dollars per person per trip and valid until 30 April 2019, except during Christmas, New Year & Easter holidays.